When it comes to leads and prospects, the answer is: you can never have enough. Growing and expanding your business is one thing, but if you ever become complacent with your sales funnel, you run the risk of the well running dry. Feel comfortable with your place today? Fantastic. But that doesn’t mean you can stop. Existing customers leave, new competitors arrive on the scene, priorities and preferences shift. You. Need. Prospects. A steady stream. Cold calls. Cold emails. Guest blogging. Lead magnets. Tried-and-true channels. You’re probably already using these. But as with everything in life, it’s survival of the fittest. You need to adapt to the changing landscape of lead generation in the 21st century or risk falling behind. So build a list. Reach out and start a conversation. Create interest. Feed your funnel. Ready to bump your prospecting sales leads up a notch? Give these a try. The classics are classic for a reason: they work. No gimmicks, just battled-hardened techniques that produce the leads you need. That’s it. Simple and straightforward. Research tells us that people are 4x more likely to buy something recommended by a friend, and rely 2-10x more on word of mouth than they do on traditional paid media. Referrals are low-hanging fruit, but many brands and individuals either don’t think to ask for them, or believe erroneously that their existing customers will say ‘no’. You should ask, and satisfied customers are happy to give them. If you haven’t already, create a referral marketing program today. Ask at the right time (immediately after a purchase or a positive interaction), offer an incentive or reward, and make it all ridiculously easy for them to do. Referred prospects are warmed, qualified, and some of the easiest sells you will ever encounter. I know, I know. People hate making them, and people hate receiving them. But here’s the best-kept secret in marketing: they (still) work. Of course, you’re more likely to generate both quantity and quality via digital channels in the 21st century, but cold calls have their place depending on your product and target. Seniors, for example, are more likely to be receptive to a cold call. Just don’t go into them willy-nilly. A bad cold call can hurt your reputation. Create a script for your cold calls, but don’t read from it verbatim. Use it as a guide and reminder of the points you want to make. Anticipate responses to questions, and craft your response. Highlight the benefits. A ‘script’ means you won’t forget anything. Give them your complete attention. Don’t promise something you can’t deliver. And be sure to give them next steps or a call-to-action. Email delivers a $44 return for every $1 spent and 174% more conversions than social media. 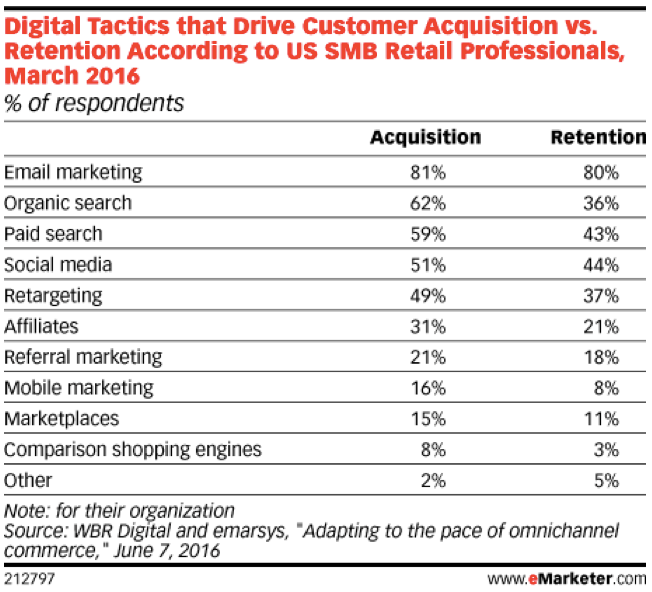 Email is the top tactic used for both customer acquisition and retention. Email generates more purchase conversions (66%) than both Facebook (20%) and Twitter (6%) combined. Cold emailing can be done with surprising ease and effectiveness today. A cold email solution like Mailshake makes it automatic and virtually hands-off until it’s time to be hands-on. Work with a template, or craft your own message. Automate wherever and whenever possible. Personalize messages automatically with merge tags. A/B test your subject lines (and your entire message for that matter). And follow up, follow up, follow up. The vast majority stop after getting no response to their initial message. 70%, in fact. Another 19% stop after a second unanswered message. That’s a huge mistake. Why? 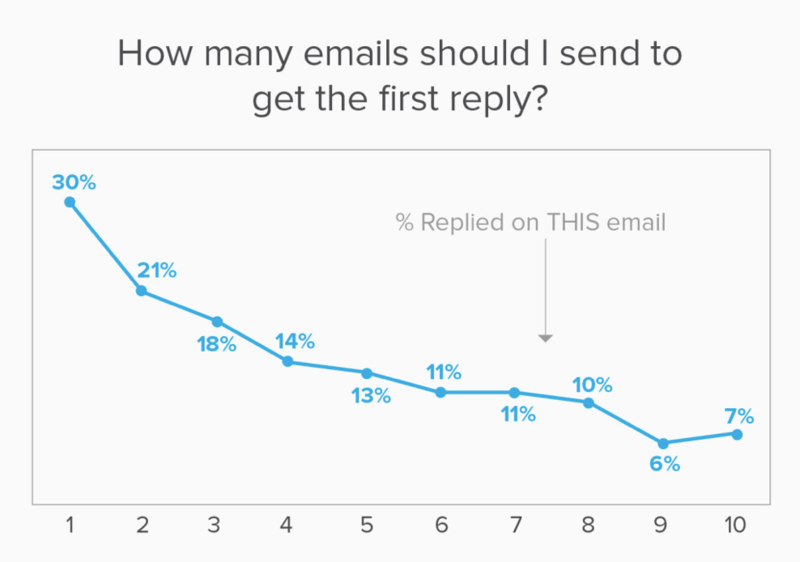 Because people respond to the second, and fifth, and even the tenth email they receive from you. Moral of the cold email story? Persistence pays off. Now, let’s build off those classics and prospect the 21st century way. Automation is not a replacement for real interaction and engagement, but it can be used in the beginning to take care of the tedious work that doesn’t require your attention. Tools like Mailshake’s Lead Catcher automate follow-ups and terminate a campaign when you get the desired response. You’ll be notified that someone has responded, allowing you to then reach out personally and directly to a pre-qualified and warmed prospect. The problem with cold emailing is that it’s, well, cold. How much easier would it be if you had a referral or introduction from someone they already know? You can use the “trickle down” technique. Reach out via email to the person above the decision maker you want to connect with. You can generally find this information from company directories and profiles. If you have names but no email addresses, use an email finder like Voila Norbert to fill in those gaps. Treat it like a regular cold connect and demonstrate your value. Do it right, and you’ll land a response along the lines of “You should be speaking with X”. Use that as a referral to engage with your intended target (“Ms. So-and-so suggested I contact you…”). Don’t treat your sales prospecting as an afterthought. It’s not. Schedule it, include it in your daily to-do list, block out time on your calendar every day to further your efforts. Write down achievable targets and goals so as to not get discouraged with it. Make prospecting sales leads a priority, and you will see results. You already know that video is a powerful and popular medium for getting your message across. A brief video message embedded in your email stands out from the crowd and gets you noticed. Using a tool like Vidyard, you can easily create and share professional videos that can boost your response rates 2-5x, and video can boost click-through rates by 27% and conversion rates by 35%. Use them, but don’t abuse them. You don’t want to earn a reputation as a sneaky, underhanded brand, business, or individual. Prospecting sales leads is usually listed at or near the top of biggest challenges for sales and marketing professionals. It’s a dog-eat-dog digital world, so you’ve got to evolve and adapt. Lean on the classics, and innovate when you can. Sales prospecting need not be that difficult.